Eric Petitti, The Treachery of Captain Sellard, ink, watercolor, and graphite on paper, 15″ x 10″, 2011. 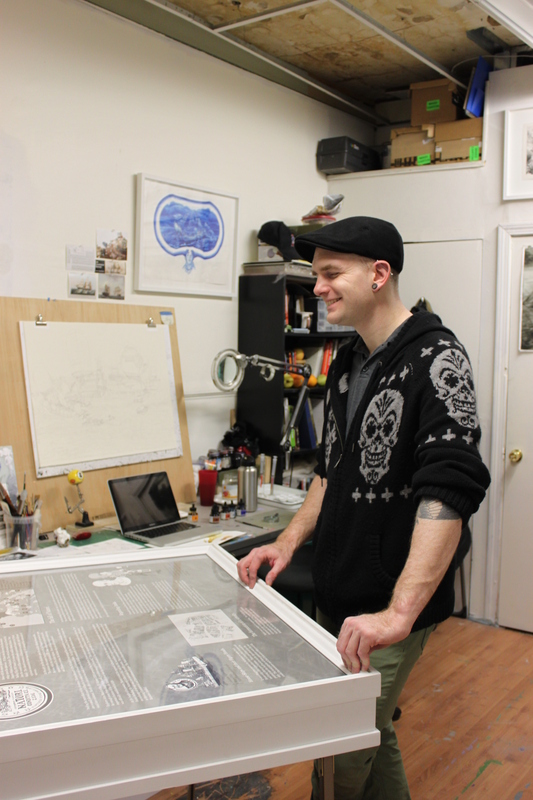 Eric Petitti received his BFA at the School of the Art Institute of Chicago and his MFA from the San Francisco Art Institute. He has shown with Johansson Projects in Oakland, CA, Proteus Gowanus in Brooklyn, NY, and has upcoming solo exhibitions at Emmanuel College in Boston, MA and Duplex Gallery in Portland, Oregon. Petitti lives and works in the Boston area. I recently encountered Eric’s work in the exhibition “All Our Tomorrows and Yesterdays” curated by Scott Patrick Wiener at Proof Gallery. Intricately detailed drawings of seemingly major future-historical events were situated in a museological-style display, complete with artifacts and descriptive wall text. I had the sense of catching a glimpse into an already-existent future. After seeing these fragments that pointed to a larger narrative, I was eagar to learn more. Eric was generous enough to have me by his studio at the Howard Art Project in Dorchester to learn more about his ongoing project. Andrea Evans: Hi Eric! Thank you for the opportunity to come by your studio and talk about your work and process. It was really great to get the chance to see behind the scenes! Eric Petitti: Hi Andrea! It is a pleasure the share more of my artwork with you and to give you a peek behind the curtain! AE: You have been developing this intensely detailed futuristic narrative, “The Dreadnaught Saga”, that is the driving force for all the work you have made for the last few years. Where and how did this narrative begin? What interested you in this process and in making this kind of work in the first place? EP: The Dreadnaught Saga first began with a painting I made in 1998 named LuCy. It featured a Noah’s Ark inspired ship laden with canons instead of animals, floating in the middle of nowhere ready for action. 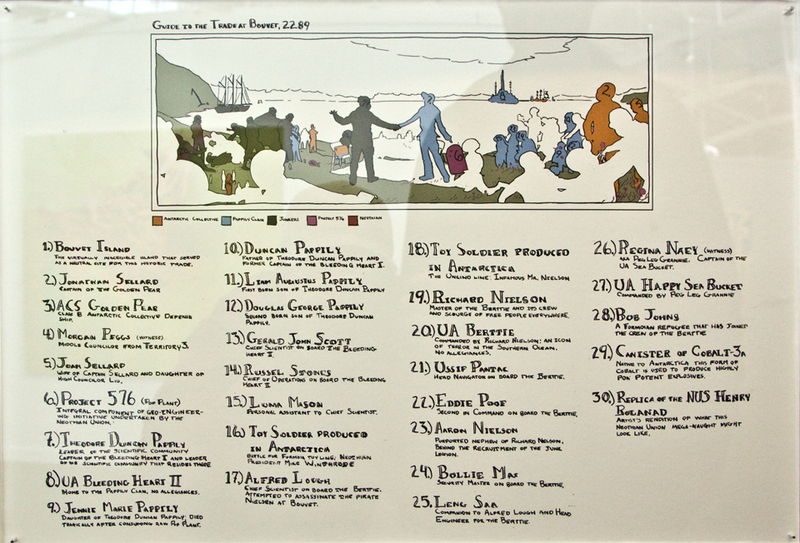 This revision of the Ark-myth was inspired by the short story The Toys of Peace by H.H. Monroe and countless conversations with my Art-nerd friends. Throughout human history ships have transported not only people and goods on a global scale. The notion that they also carry ideas, beliefs with them, and cultures really resonated with me. Even today, ships continue to drive globalization forward in a significant way. By making the idea of what a ‘ship’ is central to my art practice, I found was able to express my aesthetic and conceptual interests more freely while tying them to my own, personal history. I grew up near the old Fore River Shipyard [in Quincy, MA]. As kids we always used to drive by its dilapidated buildings and rusted gates. This dead place always held a fascination for me, although I didn’t know much about it other than the stories family members who once worked there told. As a 6th grader I jumped at a chance to write a research paper on the history of shipbuilding in Quincy (truth be told my mother wrote it, I drew the pictures). Learning about the once proud and thriving industry that was rooted in my hometown captivated me. This was the first time I remember being interested in history more than sci-fi, robots and monsters. It also depressed me because it begged the question, “What happened? Where did the jobs go?” I remember the buzz created by rumors that the shipyard might open again bringing many labor jobs back to the area, and the disappointed silence when it became a massive storage lot for new cars waiting to be sold. The loss of the monumental Goliath when it got sold to an overseas shipyard felt like removing the marker from an old friend’s grave. Looking back, this was my introduction to globalization and to this day it still provides the driving force behind this project. Eric Petitti, High Councilor Tyrell Welford’s Theory About the Missing Golden Pear (Version 1.5), from the “Never Forget the Pear!” Series, graphite and watercolor on paper, 22″ x 30″, 2011. Over time this project took many different directions before settling into itself. In the early days it was too self-serving and abstract; people liked the way I painted but the work never resonated. Then I discovered, and this may sound unromantic, that I am most creative when I am working within the parameters of a project or system. To figure out what my framework should be, I studied how and why ships were depicted throughout history: from historical paintings and engravings to contemporary mass media. My concern over global warming provided the backdrop for the project and influenced their designs thorough practical considerations and purpose. Cormac McCarthy’s The Road had a serious impact on the way I conceptualize this work. Historical Painting’s ability to commemorate a significant moment of value in order to educate about the past while covertly influencing the painting’s context and future perceptions fascinates me. Although the brushstrokes and carved stone have been replaced by pixels and moving images, this old practice is alive and well today. I appropriate this structure and use its method of influence in my future-histories in hopes of revealing their mechanizations to my audience. Eric Petitti, High Councilor Jonathan Casco’s Theory About the Missing Golden Pear, from the “Never Forget the Pear!” Series, graphite on paper, 22″ x 30″, 2010. To commemorate something, I need an event of significance to commemorate! I have no interest in writing an alternate past-history or a fictional present-time world. Those just seem a little too fantastical for my purposes. The future is imbued with possibility so I decided to commemorate events from a fictional future that is deeply rooted in contemporary issues. AE: Can you give us the basic plot line of The Dreadnaught Saga? 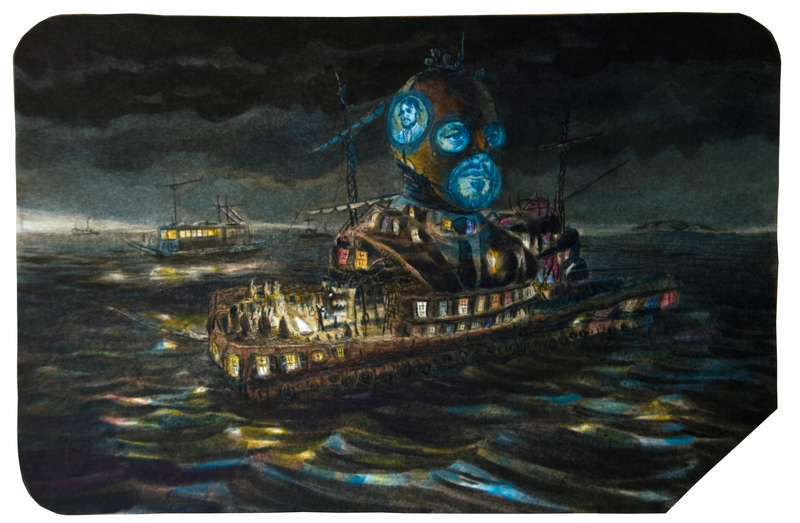 Eric Petitti, Confiscated Junk Ship 25713 (The Sellard Ship), ink, watercolor, and graphite on paper, 6.5″ x 10″, 2011. Most of the story lines I work with begin with two sources: Actual historical events and collaborations/discourse with other people. This keeps me grounded in reality and prevents the project from becoming too fantasy based. AE: Clearly there is a great deal of thought, research, and knowledge that has gone into constructing this narrative. As you mentioned, it’s not just a fantastical or dystopian world; you’re responding to contemporary issues such as climate change, loss of natural resources, and globalization, and making your best attempts to estimate as to what kind of world may lie ahead of us, and how humans will adapt to it. Why have you chosen to take this approach? Do you ever happen upon reflections of your “predictions” in real life? EP: I certainly want to inform people about the problems that unchecked climate change poses for future generations. However, I intentionally keep it in the background and discuss it indirectly through the plight of characters surviving and adapting to the situation. I’ve found that putting the issue front and center turns many people off. My research and attention to detail isn’t an attempt to predict what will actually happen in our future. By examining the science, theories and arguments about what could happen in the future, I am able to respond to and create a richly nuanced narrative for my viewers. According to the old adage “life is stranger than fiction” and I am inclined to agree with it. By packing as much real life into my Saga I feel it makes the work more familiar, accessible and relevant to a larger audience. Eric Petitti, Relna Commemorative China Serving Platter, ink and graphite on paper, 18″ x 22″, 2011. 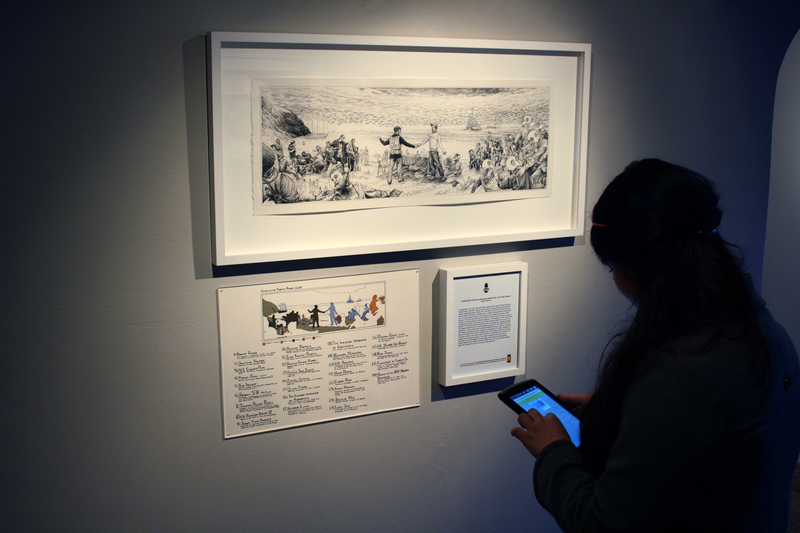 AE: Your presentation of this body of work is also carefully crafted: drawings that document different events are displayed alongside important relics as if in a museum, complete with wall text, QR codes, image guides, and other supporting details. Enfolded within this project are layers of critique that question the idea of truth and objectivity in the telling of historical events and the power and authority embedded in museological displays. Did one of these interests come first for you or have they always been wrapped up together in this body of work? 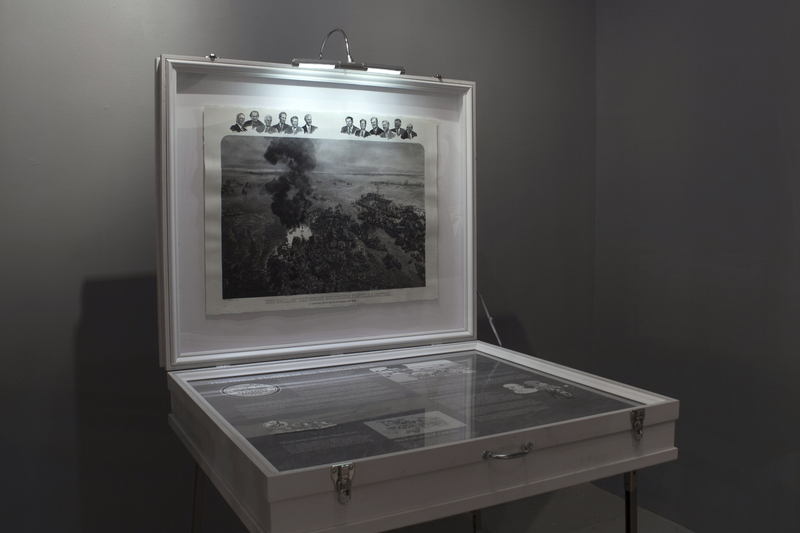 Installation view of Eric Petitti’s A drawing after the famous painting by Winifred Chin, “The Trade at Bouvet Island, 2535 ce“, 2011. EP: The museological approach has long been a part of this work, in part, because the histories I commemorate are based on new situations involving unfamiliar figures. I use the artifacts and supporting details to contextualize the project, similar to the way curators present their exhibitions. Embedded in the play between the main art object and the supporting materials is the critique of curatorial intent. Also, I’ve always thought that the walls of a museum read like a comic book. Each item and object serve as the next frame for the the curator’s story. In comic books, the reader must be wary of what happens in the space in between the frames. 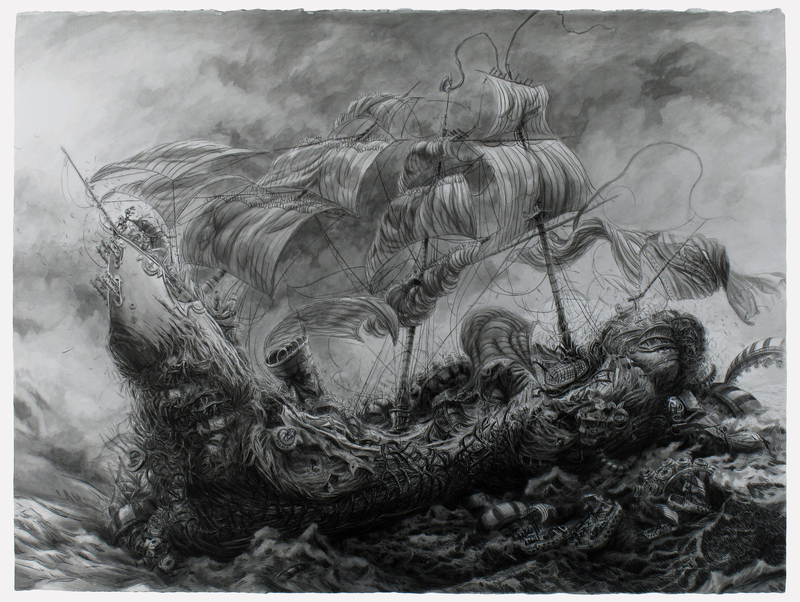 Installation view of Eric Petitti’s The Fall of the Great Flotilla Natori, sumi and graphite on paper, 22″ x 30″ (drawing), 52″ x 38″ c 35.5″ (drawing in case), 2013. AE: What is it about drawing that complements these ideas? Do you ever consider making something like a grandiose large-scale history painting, or a series of prints that would allow for greater disbursement of these images? EP: Regardless of how finished finished it appears, a drawings always tends to look incomplete, like the artist could continue to work on it. I adore this aspect of drawing. This unfinished quality has the ability to spark fascinating conversations and spark imaginations. It provides an element that the viewer can finish for the artists. Also, drawings reproduced through etchings and lithography were once the main means of distributing images across a population. The hand of the artist was apparent whether they were attempting to depict fact or fiction. Because of this, viewers tended to approach them with a higher degree of skepticism. With digital media, it is hard to tell where fantasy stops and reality begins. I have avoided prints to this point because I enjoyed the uniqueness of the singular, original drawing. I liked giving my drawings they same importance as a historical painting; something that rarely happens. Going forward, I am interested in involving prints and editions into this project. Initially I intended the Saga to be composed mostly of historical paintings. I switched to drawing at the start of this project because painting tends to hide its flaws more and possess a more finished quality to it when completed. 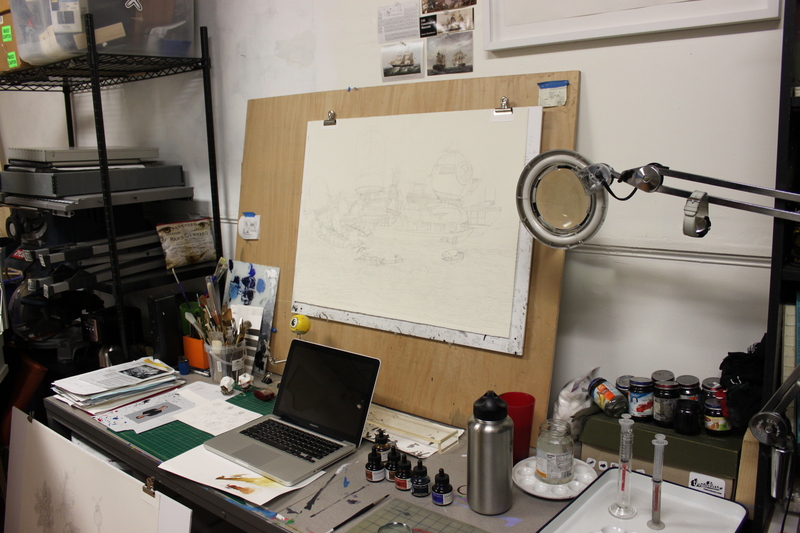 Drawing immediacy is more believable in an environment that I am depicting in my dirty future. I’m sure linseed oil and turpentine would be very hard to procure if trees could no longer grow. Of course…there could always be some rich eccentric that finds a way to do it. With that said, I am gearing up to reintroduce painting into the project. Eric Petitti, High Councilor Magdalena Relna’s Theory About the Missing Golden Pear, from the “Never Forget the Pear!” Series, sumi and graphite on paper, 22″ x 30″, 2010. AE: How do you go about planning and making one of these pieces? What kinds of references do you use? Can you describe your process? EP: The planning phase begins with a news story, bit of research or a conversation that captures my interest. I log them into my sketchbook along with any notes or sketches that will help remind me what drew me to them. Eventually I’ll assign the happening a random global location and start connecting groups and available resources to it. From there conversations with collaborators happen and I begin connecting more contemporary issues and/or historical ones to it. This helps me set the context, develop the character’s roles and figure out what point of view the artist is being commissioned to promote in the work. Also I begin thinking about how the curator plans to display the work and why. Everything else falls in place after that; lots of sketching and writing. In terms of visual references, I’ll either build a model and/or work from a photoshop composite image. AE: In addition to the drawings, you also include objects within your museum displays, such as “Evidence Lot EIMS2535/3-9228-87.e (The Nilsen Portrait)”. What is the role of these objects in relation to the images and text? 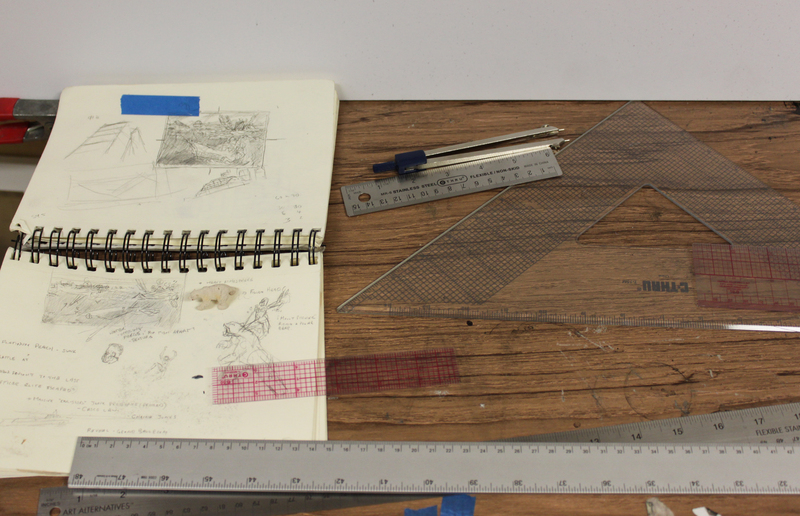 EP: There is something about a physical artifact that lends a higher degree of realism to my project. Rather than a depiction, it is a thing connected to this event. It makes the installation feel more concrete: almost like supporting evidence in a criminal trial. 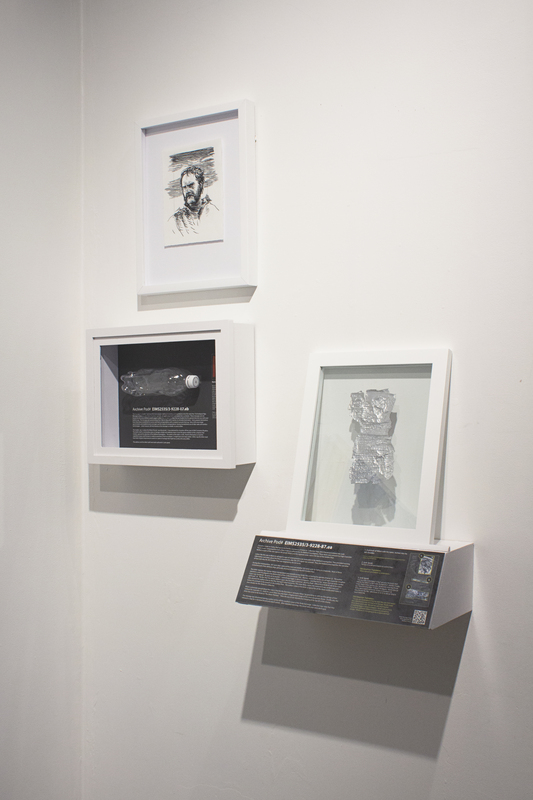 Installation view of Eric Petitti’s Evidence Lot EIMS2535-3-9228-87.e (The Nilsen Portrait), graphite, ink, paper, wood, found soda can, 34″ x 36″ x 10″, 2013. AE: You often include friends and family as models for different characters within the story. Do you simply use their likeness, or are there aspects of their personality that you bring into the plot as well? As the creator of this narrative and the encompassing body of work, where do you locate yourself within the Dreadnaught Saga? EP: Collaborators are essential in creating the historical threads of the Dreadnaught Saga. I use their likeness, personality, input and guidance in developing characters and figuring out an event’s outcome. I tie them to the reality of the situation by providing them with the context, resources they have at their disposal, other characters involved, etc. I guess that is my true role in the Saga, like the role of Climate Change, I help set the stage for the players involved in these events. Personally, it its fun to include others in my projects. They gain some ownership over the work and they enrich the work with their contributions. 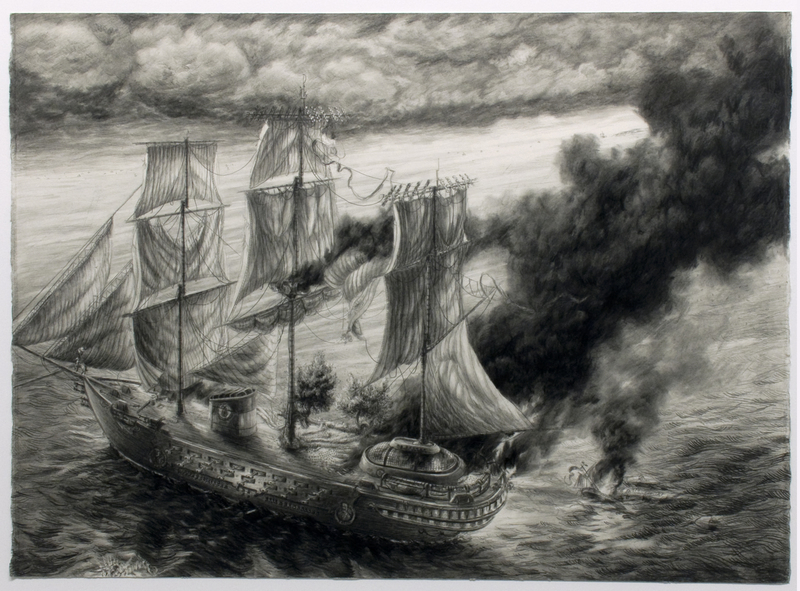 Eric Petitti, A drawing after the famous painting by Winifred Chin, “The Trade at Bouvet Island, 2535 ce”, ink and graphite on paper, 11″ x 30″, 2011. 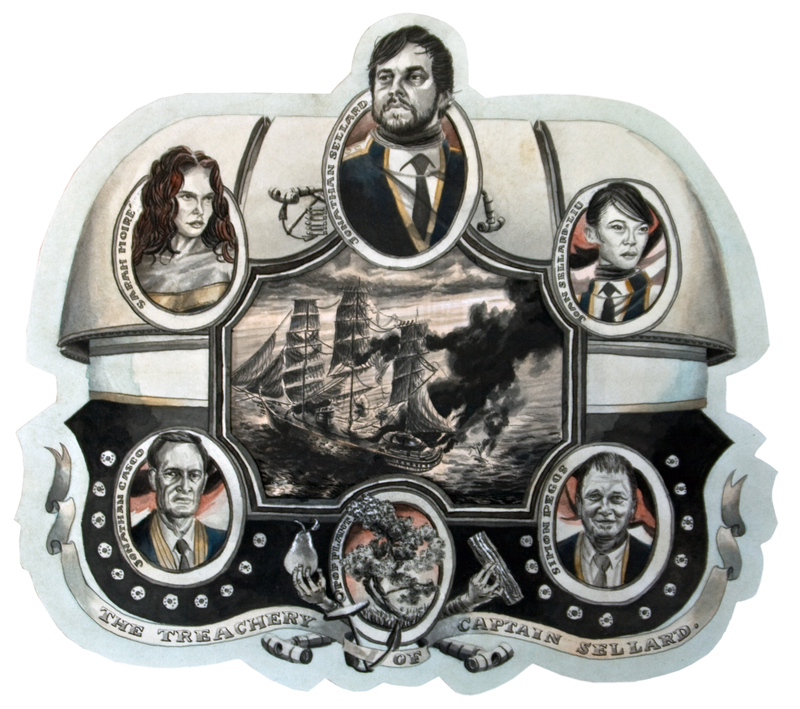 AE: So far, “The Dreadnaught Saga” has been presented in segments, such as “The Casco Revision” at Proteus Gowanus in 2012 and “Never Forget the Pear!” at Fort Mason in 2010. Do you have an ideal vision for this project in its entirety? Is the entire narrative mapped out at this point, or is it still growing? Will there be an ending to the story or to this body of work? EP: I would love to fill a small museum a few nicely competed sections of my histories, but, as of right now I’m am simply accumulating and completing segments. A complete history book would be an amazing end to this body of work. As of now, this is an ongoing project that I have no designs to stop working on. AE: Thank you Eric for your time and for sharing your work with me! EP: Thank you, it has been a pleasure talking with you! Tags: drawing, Dreadnaught Saga, Eric Petitti, history painting, museological display, painting. Bookmark the permalink. No way! I went to grad school with Eric! Hi Pam! Are you in the Boston area now too? Hey Eric- Yup! I’m up in Salem… I’m the Assistant Curator at Montserrat College of Art in Beverly. What are you up to? Salem is great, haven’t been up there in awhile. Congratulations on your position! How has it been going up there? I’m in Boston teaching and making my art stuffs. It has been going well! My email is eric.petitti@gmail.com if you want to continue this conversation.